#9113 I can't imagine what it is to see death before one's eyes and be unable to escape. It is always best to be prepared! Help us spread this important message of hope and salvation! The world was in dismay from the tragedy that filled hearts with pain and disbelief. One hundred forty-nine people lost their lives when a copilot, apparently suffering from severe psychological problems, decided to end his life by crashing the plane that he flew into a mountain in the French Alps. The images of suffering, pain and anger on the faces of family, friends and the general public have gripped the world and are striking and distressing. The uncontrollable longing, immense grief and torturous memory of what happened became the daily burden of hundreds of people who lost a family member, friend or acquaintance in that unspeakable tragedy. According to technical data available, the tragedy began eight minutes before the crash, when the unfortunate copilot decided to initiate the sharp and steady decline of the plane until its final crash against the rocks. However, according to reports, the 149 victims only realized the tragic reality that they faced a few moments before the plane's collision into the mountain. According to the recorded tape, the shouting of the victims was heard only moments before the disaster. I can't imagine what it is to see death before one's eyes and be unable to escape. One thing is certain: all those passengers who on that fateful morning stepped onto the plane in Barcelona, believed that it would take them safely to the city of Dusseldorf, Germany. There was no one who had chosen the tragedy, much less counted on it. How much laughter, joy, hope and expectation was shared during the flight, minutes before the tragedy? Certainly a lot. But at some point, someone put the clock of those lives in a countdown of 8 minutes. Eight minutes to the fatal collision. 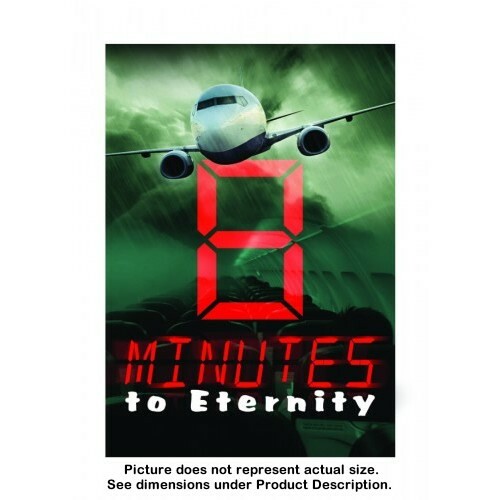 Eight final minutes of a desired existence, but abruptly interrupted. What is the greatest tragedy? The crucial question should not be to determine what drove the copilot to cause a tragedy like this—though obviously this deserves attention and reflection—but to know what spiritual condition all those lives were in. It is always best to be prepared! Our whole life is a real trip to a destination previously chosen. If I choose to live with God and relate to Him through the person of His Son, Jesus Christ, I have eternal life. Therefore, I am ready to leave this world at any time of the journey; I will be in the presence of God, in peace and security, confident that He will receive me in His arms of love and forgiveness. But if I choose to live independently of God, disregarding His invitations and calls to reconcile with Him in Christ Jesus through the recognition and confession of my sins, I will be unprepared. I will risk facing eternal condemnation and separation when the journey of my life is interrupted. That's why God warns us: "Remember now thy Creator in the days of thy youth, while the evil days come not..." "Prepare to meet thy God." No one is the master of his fate. No one really knows when or how you will enter eternity. You need to be ready when the interruption occurs. It is better to place our lives in the hands of God and depend on Him, trusting His power to keep us from all evil. Then we are ready to face Him with confidence and certainty of the wonderful destiny that He has prepared for those who love Him.